Losing 300 calories in a 30-minute time period indoors can be challenging, but is possible. A calorie is a unit of energy that the body uses to perform bodily functions and physical activity. Therefore, to burn 300 calories in one half of an hour, you must perform intense aerobics exercise. Because there are 3,500 calories in 1 pound of fat, burning 300 calories will help you lose about one-tenth of a pound of fat. Choose high-intensity exercises to meet this goal indoors. Perform high-impact aerobic exercise. Try running in place at a pace that causes you to sweat and breathe harder. Maintain a 5-mile per hour pace to burn around 300 calories in 30 minutes if your present weight is about 155 pounds. A 185-pound person consumes about 355 calories at the same pace for the same amount of time, according to Harvard Medical School. You may wear a pedometer to help determine your pace. Turn on music or watch your favorite television program to help the time pass. Perform circuit workouts. A circuit workout involves doing exercises for a predetermined time, then moving to the next workout. For example, perform five exercises for 2 minutes each and repeat the circuit three times. Choose squats, pushups, calf raises, crunches and glute kickbacks. At 155 pounds you'll burn about 298 calories and, at 185 pounds, about 355 calories. Exercise on a stair treadmill, an intense exercise that will help you achieve your goal. Look at the pace on the stair treadmill machine to make sure you are exercising at a 10-calorie-per-minute pace. 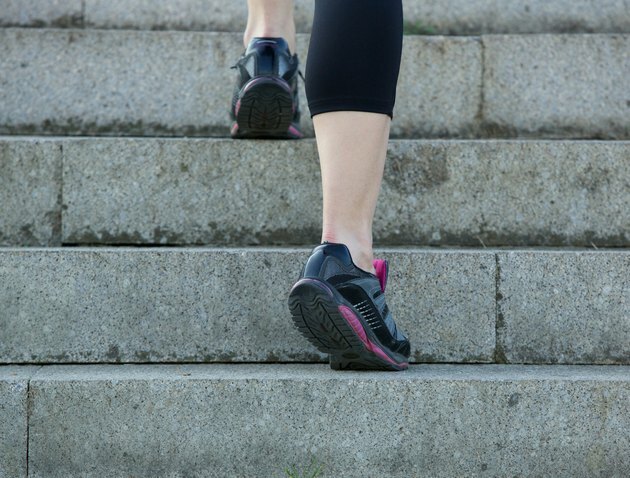 If you do not have a stair treadmill, you can walk up and down stairs at home to burn a similar amount of calories in 30 minutes. Avoid consuming excessive calories to help you lose 300 calories. If you eat high-calorie foods, you replace the calories you lost with your intense exercise. So, skip the high-calorie cookies, cakes, fried foods, sodas and juices to enjoy the results of all that hard work. In addition, try to eat more fruits, vegetables, legumes, whole grains, lean meats and low-fat dairy. According to the U.S. Department of Agriculture, you should eat one half of a plate of fruits and vegetables, one fourth of a plate of whole grains and one fourth of a plate of a lean protein for a well-balanced diet.